The astrogeographical position of Rome. Astrology, History & Politics transits of the outer planets in relation to the capital and government of Italy. Astrogeographical position of the capital of Rome which describes the international, supraregional resonance of the topics of the Italian government, political stability and development: the coordinate for the astrogeographical latitude of the italian capital Rome is located at 14°Gemini. The longitude coordinate is located right next to the cardinal divide of the summer solstice (0°Cancer) at 29° Gemini– a position which as in the case of Paris (29°Sagittarius winter solstice), Amsterdam (29°Pisces spring equinox) and Berlin (29°Virgo autumn equinox) points at the great importance of the supraregional resonance of the city.. The pressure from the transit of Neptune the planet of spirituality and an indicator for destabilisation, illusion, corruption, loosing control, paralysis, dreaming and sleeping over the 14°Pisces position and square to the 14°Gemini resonance degree of Rome between April 2017 and February 2020 resulted in a dramatical change of government after the general elections on 4 March 2018. The new government consists of a coalition of populism that brings a right-wing with a left wing party together: Lega Nord and the MoVimento 5 Stelle (M5S). Some aspects of this change may turn out positive in the long run: particularly the more strict politics dedicated to stopping illegal migration into Italy and pressure on other European Nations to take over humanitarian responsibility. But altogether Neptune´s transit could mean that the proverbial shortlastedness of italian governements is back. 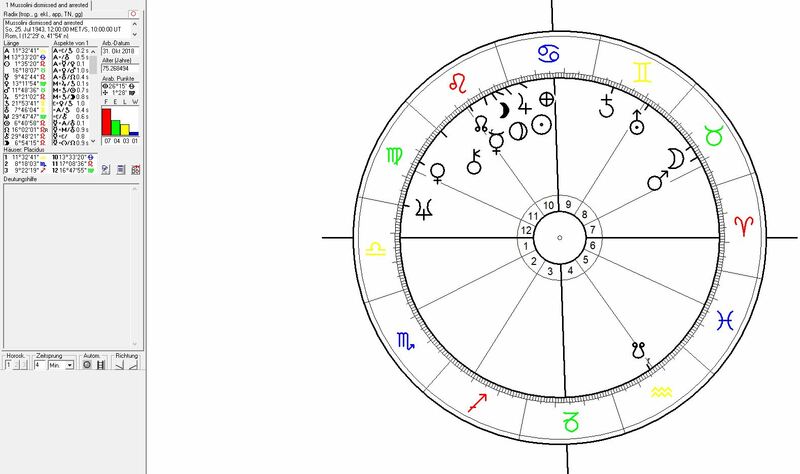 The results of the popular vote of 2 June 1946 that decided the foundation of the Italian Republic after WW2 were announced during a Sun-Uranus-North Node conjunction between 17° and 21°Gemini in a harmonious trine with a Chiron-Jupiter conjunction between 14° and 18°Libra. 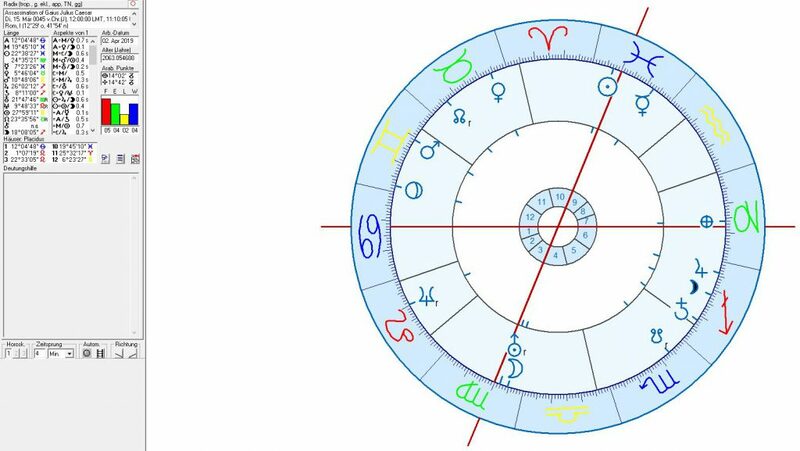 The abolition of monarchy and the decision for the foundation of the Republic of Italy came as a result of Uranus` transit conjunct the 14°Gemini coordinate of the City of Rome between May 1945 (12°Gemini) and June 1946 (17°Gemini). Mercury the ruler of Gemini was at 1°Cancer conjunct Rome´s 29°Gemini astrogeographical coordinate. 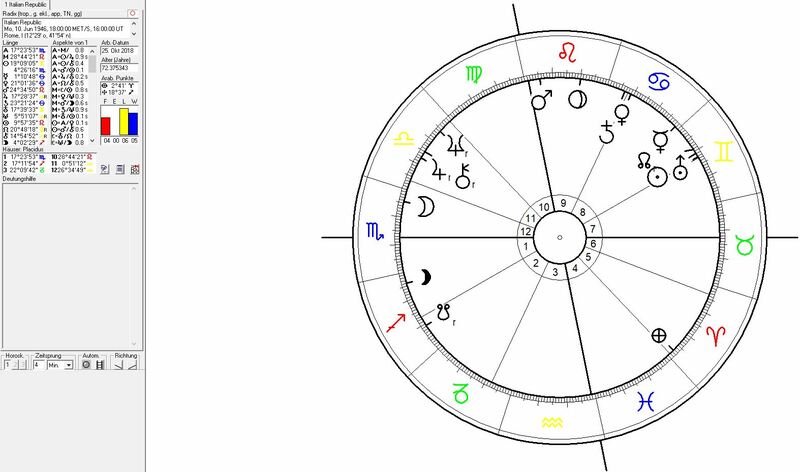 Nicholas Campion discussed the foundation chart for traditional date of the foundation of Rome in his classic “Book of World Horoscopes”. Please note that the date is speculative and astrological verification should be playful and for exploration of options whereas dogmatic argument is ridiculous. The assumed date of 21 April in either 752 or 751 B.C. i assumed for the birth date of Romulus and Remus – the City`s mythical founders. Foundation chart calculated for the City of Rome for 21. April 751jul. (21-4-752 B.C. in my astro-program)at 12:00 noon. Im showing the chart for the foundation of Rome calculated for 21 April 751 because at midday the Moon was exactly conjunct the astrogeographical resonance degree of Rome at 29°Gemini the sign that resonates with the legend of the twins Romulus and Remus whose birth date is taken as ther. 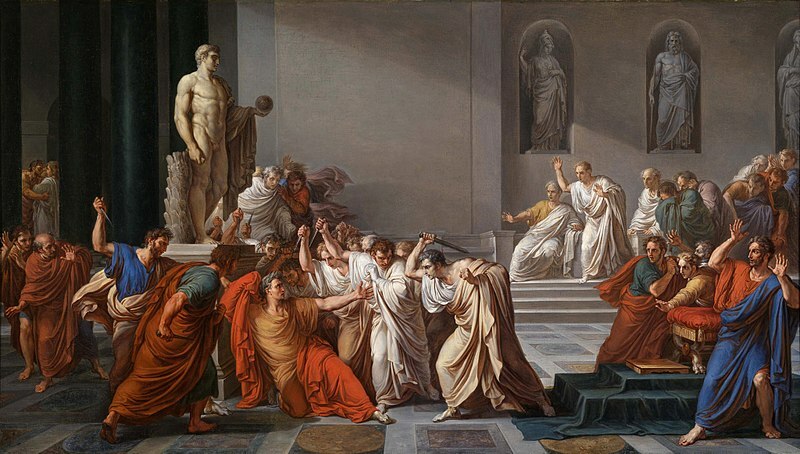 Gaius Julius Caesar´s strife for power in Rome reached a climax during square transit of Uranus over 14°Virgo to the 14°Gemini position of Rome since the end of the year 48 B.C.. Caesar had first been appointed dictatot in Rome in the year 49 B.C. and again in 48 B.C. but only for a short time. His appeal for power increased after the victory over the Republican armies under Scipio and Cato the Younger in the Battle of Thapsus on 6 April 46 B.C. with Pluto at 26°Gemini approaching Rome´s 29°Gemini astrogeographical position: He was then appointed dictator of Rome for 10 years until on 1 January 44 B:C. he was made lifelong dictator. From that time on Pluto the planet of group hierarchy thus stood for the dictatorship over Rome. It has to be understood that Uranus in Virgo next approached the square position to Rome`s 29°Gemini coordinate with Pluto on it. 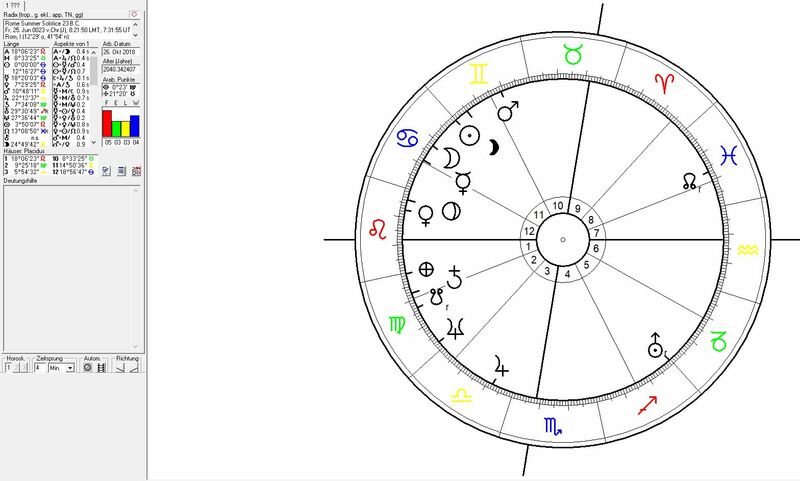 The assassination of Gaius Julius Cesar was carried out by a group of murderers during a Uranus- Pluto square with Pluto exactly conjunct the 29°Gemini astrogeographical position of Rome and Uranus in a square vom 22°Virgo the sign of precaution and cojunct the Moon at 25°Virgo. Pluto has to be understood as the resonating planetary factor for the dictatorship of Gaius Julius Caesar since the year 46 B.C. and until the day of his death. The peculiar effect of the Pluto conjunction to the capital during the assassination is that the resonance topics of Pluto a in its role as the planet of defense, trauma, pain and of the strife for dominance and tyranny in social hierarchy onto the assassinators. 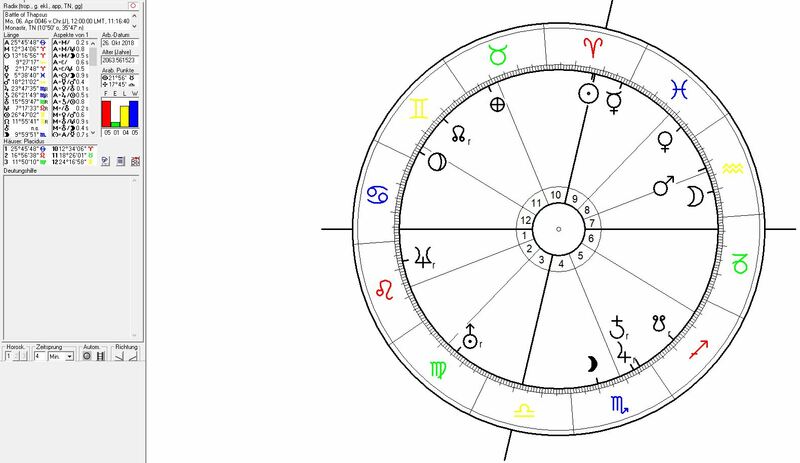 Astrological chart for the assassination of Gaius Julius Caesar on 15 March 44 B.C. (calculation has to be made for 45 B.C. During the assassination of Gaius Julius Caesar Uranus the ruler of rebellion was helped through an opposition of Jupiter as the planet of victoryto the capital and government form 26°Sagittarius. The last degrees of Sagittarius indicate the support from the castes of priests, teachers and other profiteers . The rulership of Augustus (or Octavian) over Rome was established through the “Principate of Augustus” on 13 January 27 B.C. 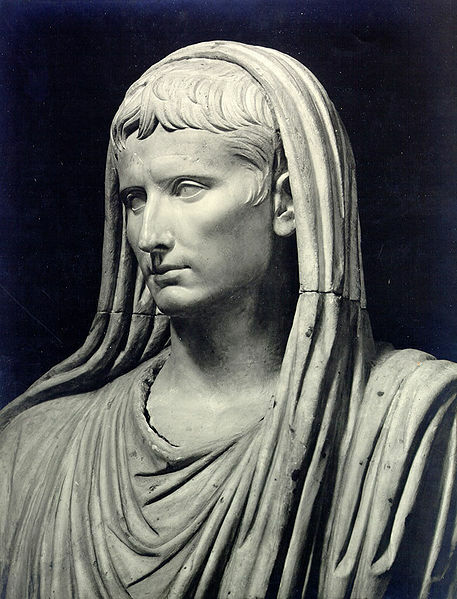 Octavian did not become the official dictator but found ways to establish his rule over Rome by avoiding the official abolition of the Roman Rupublic. The astrogeographical transits that reflect this strategy were from Jupiter and Neptune. Jupiter at 21°Gemini the sign of parliaments, liberty and personal opinion was conjunct the half sum between the 14° and 29°Gemini astrogeographical coordinates of Rome in an aspect that seemingly supported the role of the parliament (Senate). Compare the return (conjunction) of Zeus (Jupiter) to Athen`s astrogeographical position during the liberation of Greece from the Ottoman and Fascist German occupations. Neptune the planet of spirituality, legends, mystification, dreaming, illusion, anaesthetization and reconnection with the eternal souls of the people at 21° Virgo was in exact square to Jupiter and to the half sum between the resonating degrees of Rome as well. This sophisticated Neptune transit points at the hidden strategies used by Augustus to hide his dictatorship behind the appeal for a restoration of the Roman Republic after the long and exhausting civil war. Augustus became the official “saviour” of Rome. The next step in Augustus` rise to absolute power was reached 4 years later with Uranus in exact opposition at 29°Sagittarius and Neptune in exact square from 27°Virgo to the 29°Gemini resonance degree of Rome: Augustus was greanted lifeling rights to decide over all Roman provinces, political institutions and of the Pontifex maximus (Pope) of Rome. 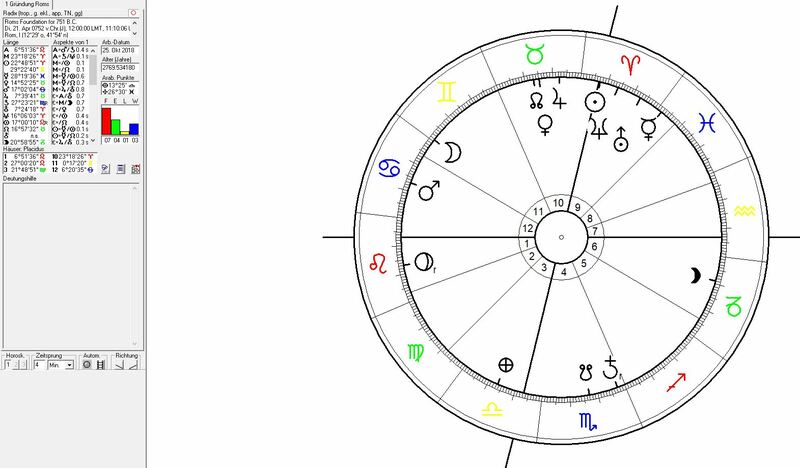 Astrological chart for the summer solstice of 23 B.C.. Uranus spent the year passing over the exact opposition to Rome while Neptune approached the exact square. 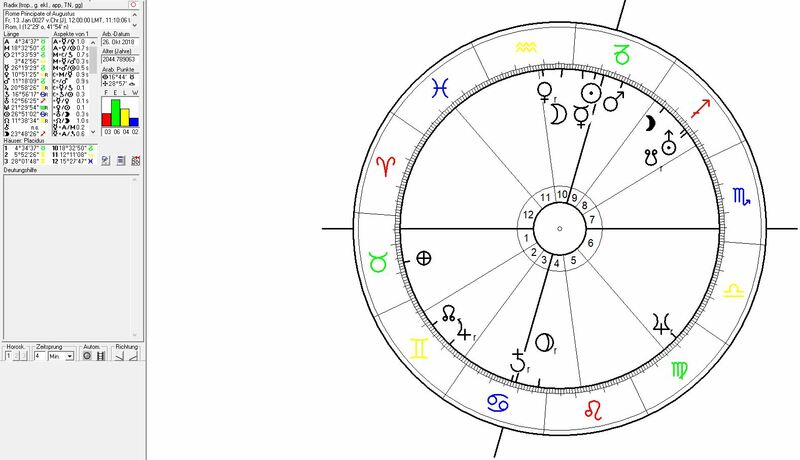 im showing the chart for the summer solstice as the exact date of the tribunicia potestas seems unclear. Uranus` opposition to Rome was used by Augustus to stabilize his power. This means that Uranus seems to have put pressure on the Republican institutions but not on the government. The Sabian symbols for 29°-30°Sagittarius (The Pope Blessing the Faithful) and for 0°-1°Capricorn (An Indian Chief Claims Power from the Assembled Tribe) seem to have materialized through Uranus` transit here. Neptune`s simultaneous square transit seems to have had a paralyzing effect on Augustus` opponents and the democratic institutions – when used to disguise the secret coup d`etat. 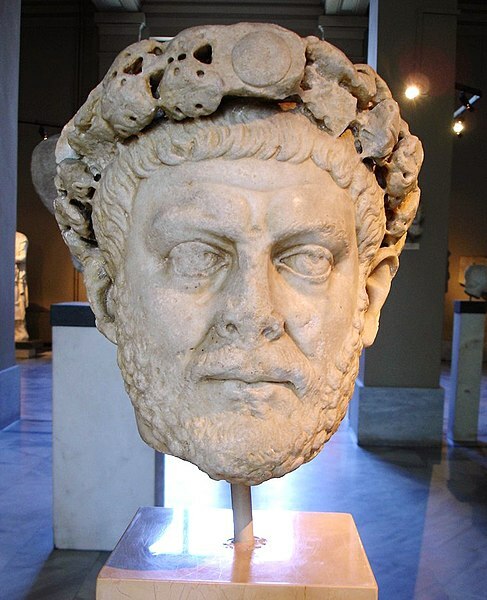 In the year 286 A.D. emperor (20 Nov 284 – 11 May 305) Diocletian divided the Roman Empire into two halves (west and east) moving the capital of the Roman Empire to the City of Mediolanum (Milan) during the heaviest transformational pressure from Pluto´s opposition. The astrogeographical positions of Milan are 19°Pisces and 21°Taurus. The years 284-288 saw the climax of Pluto`s transit over 29°Sagittarius in opposition to the 29°Gemini astrogeographical position of Rome. The maximal pressure onto the city of Roman by this transit is reflected in the loss of the status as the capital of the empire and also the division of the empire into two halves. 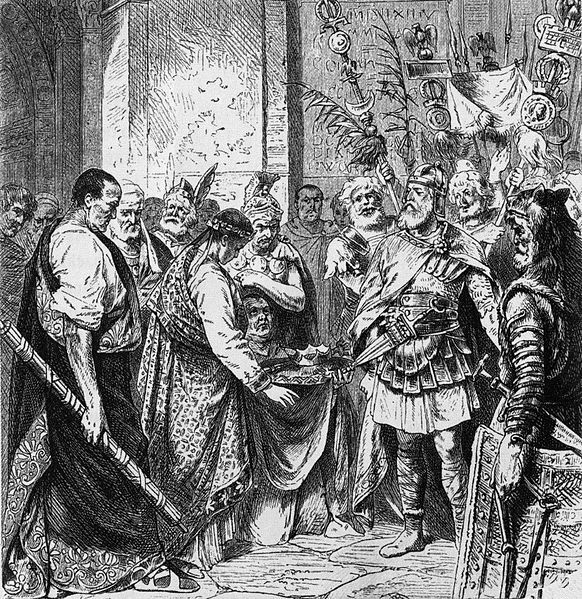 Officially the Roman Empire was terminated on September 4, 476 – a New Moon day when Odoacer forced the 16-year-old Romulus Augustulus to abdicate and became the first King of Italy. 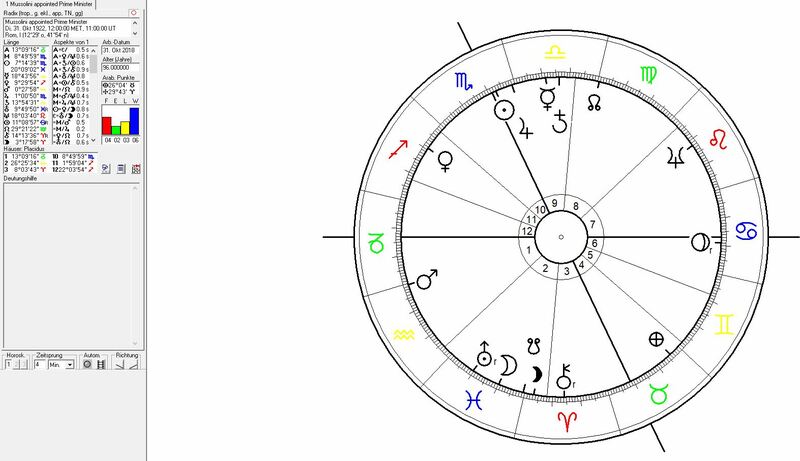 Astrological chart for the end of the Roman Empire calculated for 4 September 476 at new moon. The new Moon conjunction of the day occured at 12°58 Virgo in exact square to the 14°Gemini astrogeographical coordinate of Rome pointing at a moment in time when a new era began. Uranus conjunct the South Node shows the erasion of traditions and through the position in Sagittarius the extinction of past glory, luxury, knowledge and success. A classical example for a Uranus square to a capital and the pressure on the stability of political institutions and the government effecte by this transit: the March on Rome was an organized mass demonstration of an estimated 25.000 – 30.000 people on 28/29 October 1922 with the aim of forcing King Victor Emmanuel III of Italy to appoint Benito Mussolini‘s of the National Fascist Party as Prime Minister of the Kingdom of Italy. Another 25000 black shirts were demonstrating in the capital Rome during the “March” and fascist troops gathering outside of the capital. 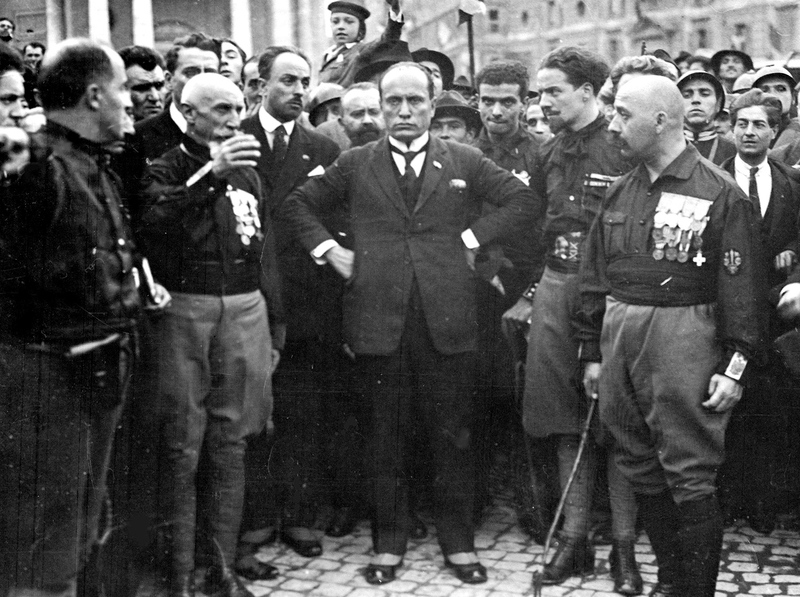 Mussolini was appointed Prime Minister of Italy on 31 October 1922 during Uranus` transit square to the 14°Gemini astrogeographical coordinate of Rome between April 1922 (12°Pisces) and February 1924 (16°Pisces). 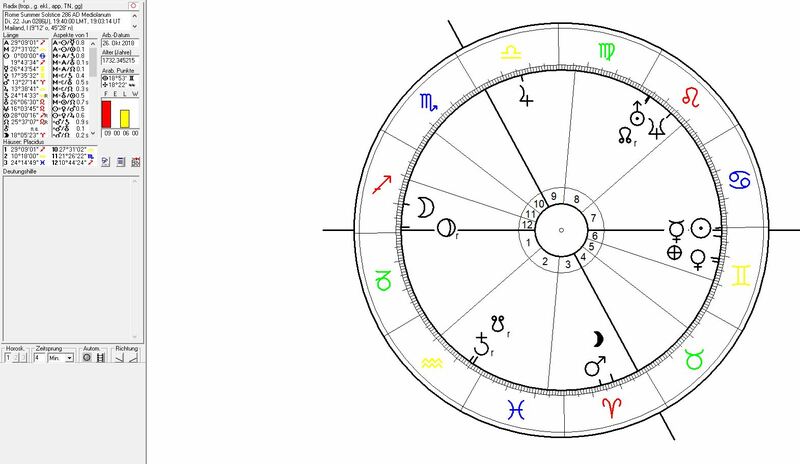 In the following years Mussolini gained more and more control over the political institutions to rise to absolute power under the transit of Uranus square to the 29°Gemini coordinate of Rome between April 1926 (27°Pisces) and January 1928 (1°Aries). The North Node was indicator of the aims of Mussolini´s legal rise to power was at 29°Virgo in exact square to the 29°Gemini astrogeographical position of Rome and conjunct the astrogeographical position of Berlin where 10 years later Mussolini`s austrian-german copy Adolf Hitler gained political control. The effects of Neptune`s square transit to the 29°Gemini coordinate of Rome must have been at work since Neptune first reached 27°Virgo in November 1940. Italy had been degraded to the role of a puppet state of the german fascist regime with its lust for war, hate, mass murder and destruction through its entrance into WW2 in June 1940. Paris and Amsterdam the other two european capitals with a strong resonance to this Neptune transit conjunct the 29°Virgo astrogeographical position (topic of self-destruction and paralysis of the people) of Berlin, too were completely overshadowed (Neptune square) under the fascist german occupation since May 1940. 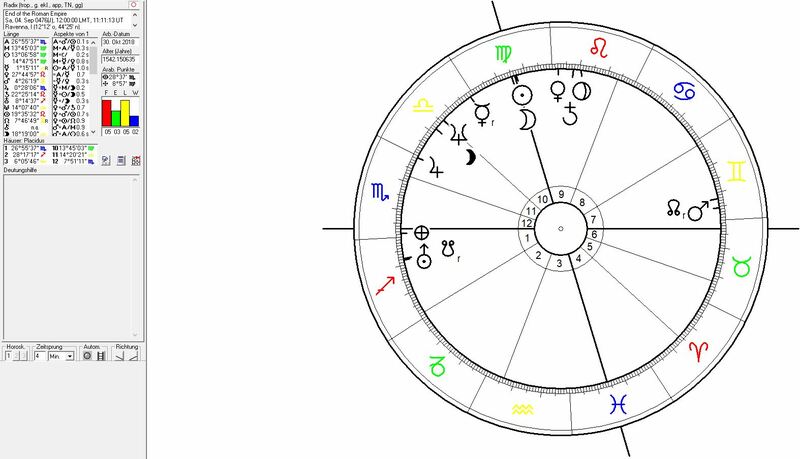 During the dismissal of Mussolini Saturn the planet of stabilization was on 21° Gemini occupying the half sum of the cinjunctions between the 14° and 29°Gemini coordinates of Rome. In cases like Rome where both astrogeographcial coordinates are in one and the same sign and so close to each other this kind of saturn transit seems to enforce the regaining of power over the autonomy of the country. Though Mussolini´s dismissal did not drive the Germans out of Italy straight away Saturn`s final transit over the 29°Gemini coordinate in June 1944 and shortly after the Normandy landings seems to have terminated (exorcistic effect of Saturn) the fascist german rule over Italy.